They hammock overhead, stretch alongside our lives, crisscross our comings and goings, drape our days and fade into the lamp-lit night. To carry forth Susan’s current from her powerful “life electric” post, I’m struck by how complacent I have become to the complex landscape of electricity that webs our sky. 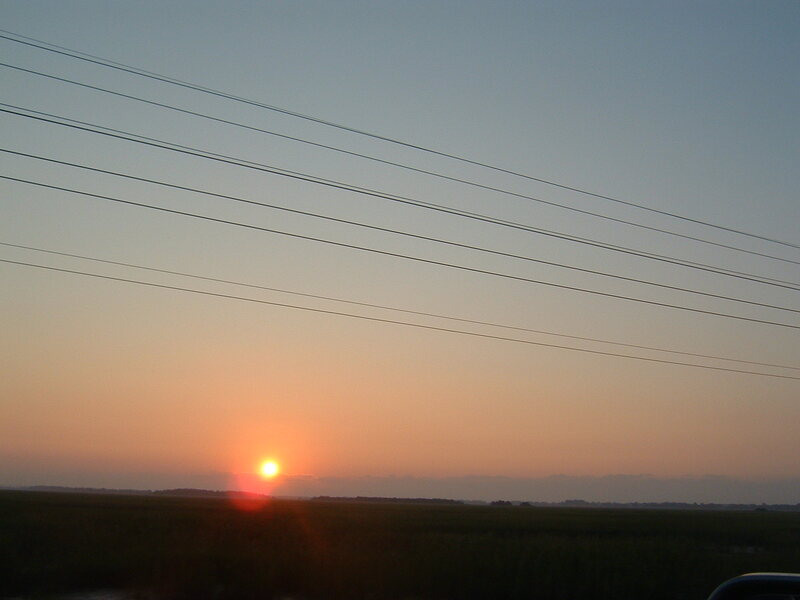 I hardly notice it; I overlook the drab black wires, while depending thoroughly on the high-voltage they deliver. 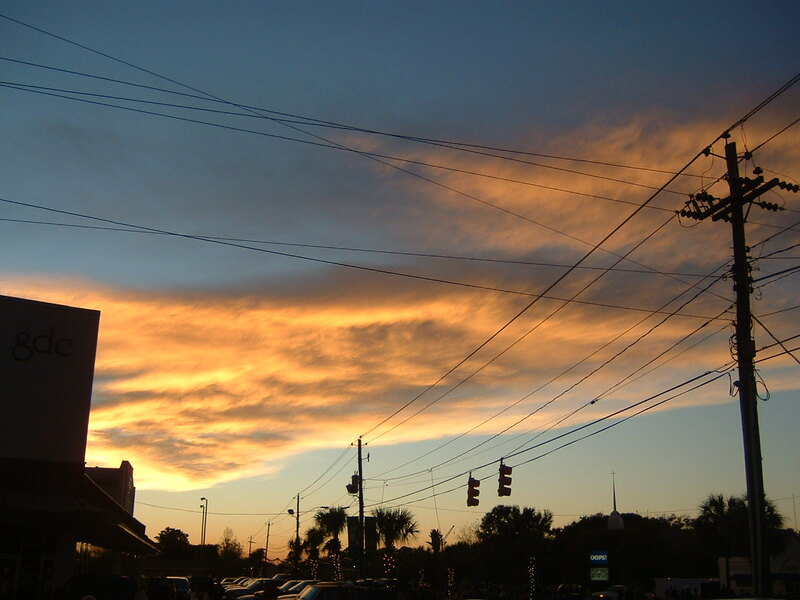 Until, of course, SCE&G recently decided to “upgrade” the power lines along Coleman Boulevard, our town’s main street. Massive 95-foot tall towers of steel, like surreal cacti on steroids, began cropping up last spring, and now they tower over the boulevard, rising high above the tree-line, looming with an in-your-face industrial, utilitarian ugliness that infuriates me out each time I pass by. How could we have such disregard for natural beauty? For any sense of proportion? How long, I wondered, would it take until they, too, would just blend in with the landscape and I’d stop “seeing” them, the way I have more or less stopped seeing the wiry grid that has hung above me, linking my homes, my neighborhoods, powering my life, all along? The way I stop seeing piles of clutter around my house. The way whole days can slip by without me thinking about people who were once the wattage of my being, and now are gone. It turns out that I’m not the only one incensed by the behemoth poles invading our quaint streetscape. Town Council responded to constituent grumbles by approaching SCE&G and asking them about “improving the appearance” — hoping maybe that a little touch-up paint might do the trick. Actually, I’m not so sure that aesthetic improvement is possible, or the best plan. Maybe this daily visual assault will make me more aware of my voracious use of electricity, of the price of energy dependence, and more symbolically, of the Big Things that loom and cannot, should not, be overlooked. ~ by Stephanie on 10/10/2011. I read your piece in “Skirt” on dorm life and was immediately drawn in by your story and writing. My dorm room number my freshman year was 302, and 301 was a much larger room at the end of the hall with two doors and windows instead of our one door. So, I immediately wondered if your daughter was moving into the same dorm (though, I thought, it couldn’t be as that would be much too coincidental.) When I reached the end of the piece, I found the link to this blog and clicked immediately. The writing here is exquiste. I am glad I found you both, and I am sorry your paths have held so much pain in recent days. Thank you both for the finely crafted and very honest way that you share your experiences. May God bring mercy and healing in both your lives. I”ll never look at those ugly wires the same way again. Big Things not to take for granted. Wattage that keeps me going: that’s what your writing is.